May Day! May Day! I am sure many of you will agree with me that we can�t take too many dramatic games like the one against Liverpool yesterday. My blood pressure went through the roof as Spurs battled like lions to get a richly deserved draw. I needed a rubdown at the end with the Sporting Life, and even as I type now my fingers are trembling on the keyboard. I was at Anfield back in 1973 when Pat Jennings miraculously saved two penalties (one from Tommy Smith, the second from Kevin Keegan). But even this did not match the drama of the last minutes yesterday when Our Harry Kane missed one spot-kick and then converted the second to complete his century of Premier League goals. Who on earth is writing this young man�s script? His storylines are out of the Alfred Hitchcock school. 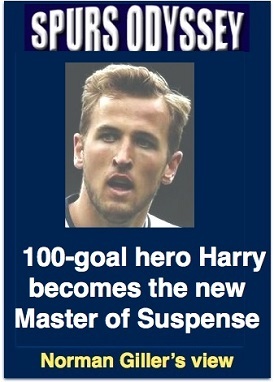 He is the new Master of Suspense. Harry has lots of hat-trick balls in his lounge at home. He also has big balls as he proved by having the character to immediately volunteer for the second penalty, so soon after making a mess of the first one. I would have hidden behind one of the posts. As I type, Sky are showing every one of his 100 goals. So many classics among them. How lucky we are to have him in our lifetime � and there are some of us who were also lucky to be around for Greavsie at his peak. Thanks James � thanks Aitch. What a privilege to be an eyewitness to their genius. I loved the way cheeky Christian Eriksen played the role of foreman of the jury as the referee and linesman had their confab over the disputed second penalty. �Guilty, m�lud,� said the grin on the Prince of Denmark�s face. What courage by the linesman to say his piece. I doubt if he would have done that in the days of the old Kop! It might have been the last thing he ever did. Our guru Paul H. Smith gives the balanced match facts HERE, while rightly crowing that he predicted a 2-2 draw, but even he could not have imagined it coming in such astonishing fashion. The stunning goal by Victor Wanyama and then the conjured masterpiece for Liverpool by Egyptian magician Salah would normally have been enough to satisfy any spectator, but finally it was the penalty dramas that claimed the main headlines. Surely the finale of the season? If there is something more sensational to come, I'm not sure my old ticker will take it. I have to park my Spurs bias and say that I was pleased to see Dele Alli getting booked for his obvious dive during the tense and thrilling second-half. Everything must be done to wipe out the culture of cheating that is scarring the Beautiful Game. Dele does not need to do this sort of thing. He has all the talents and should just concentrate on beating the opposition with his natural skill. Now for the FA Cup replay against Newport on Wednesday in the tournament that represents Tottenham�s best chance of silverware this season. Pochettino will have to nail Our Harry to the dressing-room door to stop him getting on for at least the first hour. Then we want him saved for Saturday�s showdown with that other team from North London. WEEK 25 of the Sports Odyssey Quiz League 2017-18. The rules are simple: I ask one Tottenham-related question for which a right answer earns you two points, and then a related teaser that can bring you an extra point. The questions are always easy, provided you know the answers! The winner this season will get a framed certificate proclaiming him (or her) the Spurs Odyssey Quiz Champion, plus a no-longer-in-print autographed GOALS book by Spurs idol Jimmy Greaves and another collectors� item from my Greavsie collection: Football�s Greatest Entertainers, signed by Jimmy and Tottenham�s Mr Loyalty, Steve Perryman. Which son of an Olympic basketball player appeared 26 times for his country, and in 98 League and cup games for Tottenham? To which boss was he later assistant manager at the Lane? Please email your answers by Friday�s midnight deadline to: soql25@normangillerbooks.com. Keep a check on your points score, because I can never rely on my server that often loses emails in the ether. You will receive a response from me, and I apologise that for health reasons you had to make do with cold automated replies last week. I test you with Spurs questions until the last few weeks of the season, when I introduce the dreaded tiebreaker teasers that call for your opinion as much as your knowledge. But please remember, we are all in this just for fun, with the common bond of admiring all things Tottenham. Question 24 was: Who joined Tottenham from Blackburn Rovers in 2008, and won seven England caps? Against which of his former clubs did he score his first League goal for Spurs in a 4-4 draw? Yes, you all came up with the correct answer: David Bentley, who scored that memorable long-range goal against Arsenal in an unforgettable 4-4 draw. A brilliant but frustrating player, his days were numbered at the Lane the day he tipped that bucket of water over manager Harry Redknapp. You could never make Aitch look a drip. First name drawn from the correct answers: Toronto-based, Canadian-born Don Marshall, who has been a Spurs fanatic since he was four and followed the club closely from when he lived in England for 28 years. I will send Don a screen version of my Spurs �67 book (I have now sold all copies, and the book raised �4,000 for the Tottenham Tribute Trust to help our old heroes Thank you all those Spurs Odyssey followers who gave their support).